Newly remodeled bungalow. In fabulous Maggie Valley North Carolina. Property 2: Newly remodeled bungalow. In fabulous Maggie Valley North Carolina. EZ Access - On Jonathan Creek - No Steep Inclines - WiFi - Max (Gold) Cable pkg. Property 5: EZ Access - On Jonathan Creek - No Steep Inclines - WiFi - Max (Gold) Cable pkg. Quiet Cabin in the Smoky Mountains. 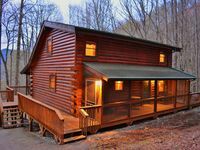 Property 10: Quiet Cabin in the Smoky Mountains. Easy access, minutes from skiing, pet friendly, wifi and cable, cleaning incl. Property 22: Easy access, minutes from skiing, pet friendly, wifi and cable, cleaning incl. SPECIAL- book 2 nts, get 25% off each add’l nt!RECHARGE HERE-private & clean! Property 28: SPECIAL- book 2 nts, get 25% off each add’l nt!RECHARGE HERE-private & clean! Property 29: ALL INCLUSIVE RATES!!! $60 OFF SPECIAL!! 5-STAR RATED SINCE 2007! NEW HOT TUB! BEST LOCATION & CLEAN! Property 33: $60 OFF SPECIAL!! 5-STAR RATED SINCE 2007! NEW HOT TUB! BEST LOCATION & CLEAN! “Living The Dream” - Private Log Cabin w/ Mountain Views Has It All! Property 42: “Living The Dream” - Private Log Cabin w/ Mountain Views Has It All! Smoky Mountain Getaway Awesome View! Property 43: Smoky Mountain Getaway Awesome View! 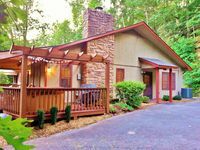 Pet friendly..handicap access..easy winter entry..
Property 45: Pet friendly..handicap access..easy winter entry..
'Emerald Gate Farm' Cabin Nestled on 13 Acres! Property 47: 'Emerald Gate Farm' Cabin Nestled on 13 Acres! The attention to the little details this place has is what sticks out the most. Everything has been thought about for your stay. The only thing you need to bring is clothes and personal items. Our stay was excellent, the best trip we have taken in our 8 yrs together. We will be booking again soon and bringing the whole family. Thank you again leslie. Also thanks to Rhonda she made things easy. We very much enjoyed our stay. I highly recommend this unit if you are considering it. The owner was very friendly, responsive and informative. The cabin had everything we needed and was very clean. We had no problems at all. Easy to get to and in a great location for area things to do.